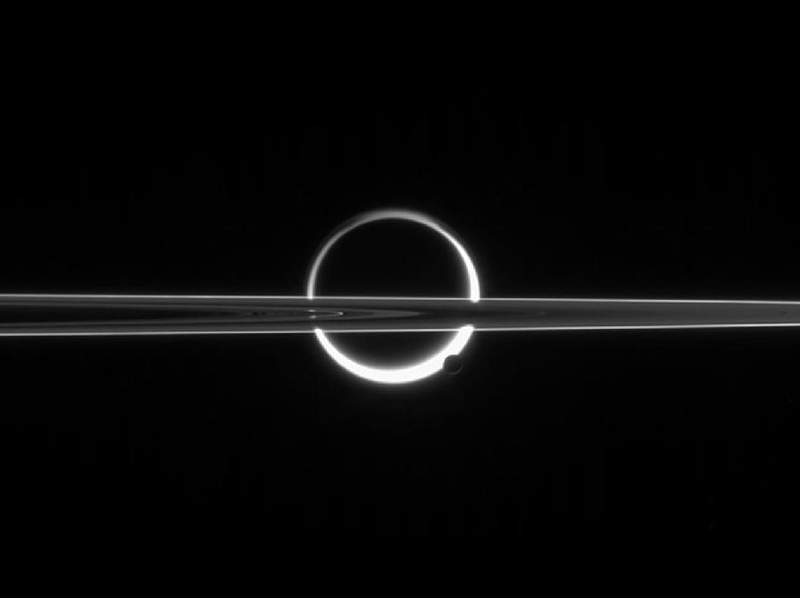 CANDLES IN THE DARK--Saturn's rings cut across an eerie scene that is ruled by Titan's luminous crescent and globe-encircling haze, broken by the small moon Enceladus, whose icy jets are dimly visible at its south pole. North is up. The scattered light around planet-sized Titan (5,150 kilometers, or 3,200 miles across) makes the moon's solid surface visible in silhouette. Enceladus (505 kilometers, or 314 miles across) enjoys far clearer skies than its giant sibling moon. This view shows the unlit side of Saturn's rings. The image was taken in visible red light with the Cassini spacecraft narrow-angle camera on June 10, 2006 at a distance of approximately 3.9 million kilometers (2.4 million miles) from Enceladus and 5.3 million kilometers (3.3 million miles) from Titan. The view was obtained at a Sun-moon-spacecraft, or phase, angle of about 160 degrees relative to both moons. Image scale is 23 kilometers (15 miles) per pixel on Enceladus and 32 kilometers (20 miles) on Titan.